There is at least three modes of travel, and most trips contain a blend of all three. 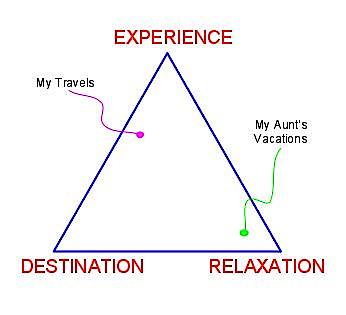 You can graph the three extremes as three corners of a Travel Triangle: Relaxation, Destination, and Experience. The ideal trip would have an equal balance of all three, but most trips favor one side over the others. In my own personal travel I favor experience and destination and have almost no interest in relaxation. Your mileage may vary. Because I am deeply attracted to experience and learning, I find myself heading toward the exotic in my travels. Whenever I have a chance, I want to go to the most different place I can get to the fastest. And I rarely want to return to where I’ve been. In the relaxing mode of travel, returning to the same place is a large part of what makes it relaxing, even deeply comforting. The “family place” is of this type of renewal. In general this kind of restful vacation does not re-charge my batteries. I need to be squeezed by new things, rubbed hard with differences, and moved by something I did not expect. So in my travel I try to optimize “otherness.” I am not looking for discomfort per se, or just roughing it, an outright death-defying adventure. That’s a bit more destination and goal oriented than my fancy. In fact, learning does not have to be done out in the rain. You can journey to otherness without making it an endurance race. That’s a balance I look for: trips that maximize experiences without requiring a focus on just the experiences of moving, racing, overcoming, winning, and achievement. Accessible exotic is possible. I have my favorite places where I can fly into an international airport and then within a few hours swim in a total different culture offering alien lessons. A lot of these spots are in Asia, but also in other corners in the world. The picture below was taken in a place that is no longer so accessible. 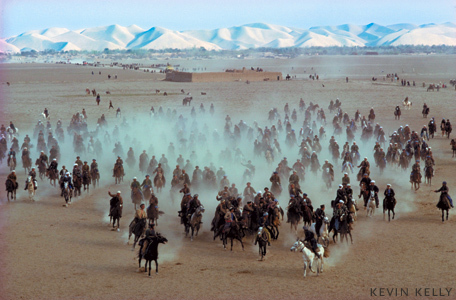 But when I took this picture of goat ball game (buzkashi) in Afghanistan, I was not flying in a helicopter. Rather I had taken a $2 public bus ride to a town in the north and followed the crowds to the edge of town and was sitting on a hillside with hundreds of others watching the Friday games. It was easy and exotic. The easy exotic is not hard to find, and so immensely rewarding when touched. Easy exotic is a place you should be able to reach within 24 hours or less from your front door. And it should reveal to you at least 5 things within the first day, or next 24 hours, that cause you to smile in amazement, and wonder at the nature of humans. Great post, Kevin. This is how I’ve optimized my (limited) choices in travels as well to Peru, Argentina, Vietnam, Tanzania… I’d love to know how you chose to go to Afghanistan, and when was this photo taken? I would love to see South America in general, but Brazil specifically. I just have to wait for more money and my son to be a bit older. Stupid adulthood. I’d love to be more adventurous. I don’t like traveling (“travelling”?) too much because I stress easily. Not knowing the gate to my flight at least 60 minutes in advance makes my blood pressure ramp up quickly. Thinking about the many things that can go wrong gives me the shivers. That said, the times I’d traveled to a place I hadn’t been before, or in general done something that I hadn’t done before, the experience has been a bit stressful but fulfilling. Things are never so bad as you imagine they’ll be. So, to stop digressing, I’d put myself strongly on the “relaxing” corner. With some specks on the other ones from time to time. Great post – thanks! Where would business, work related travel fit in – Destination ? (since it’s about Achievement/Accomplishment as well). Maybe Destination should be renamed to: PERFORM (since Destination in the travel context means usually just reaching/exploring a specific location). Experience could become TRANSCEND (since that’s the type of experience you’re describing). And the third one is still RELAXING or just RELAX. I love it. I’ve always defined my triangle a bit differently – family, adventure, and relaxation. I did a factor analysis based on survey data, which asked people where they went, when, why, how long, mode of travel, etc. The upshot was that people traveled for either business or personal reasons. If personal, it was either a destination (like Disney) or to visit family. So, maybe we have a triangle with DESTINATION, RELAX (FAMILY), BUSINESS. Your website is very nice. I visit all the time. You been sharing useful information. We are familiar with in your way.